In this tutorial, I’m going to show you how to add a shallow depth of field effect to a landscape photograph using the Tilt-Shift Blur Filter in Adobe Photoshop, and then refine it with layer masking. 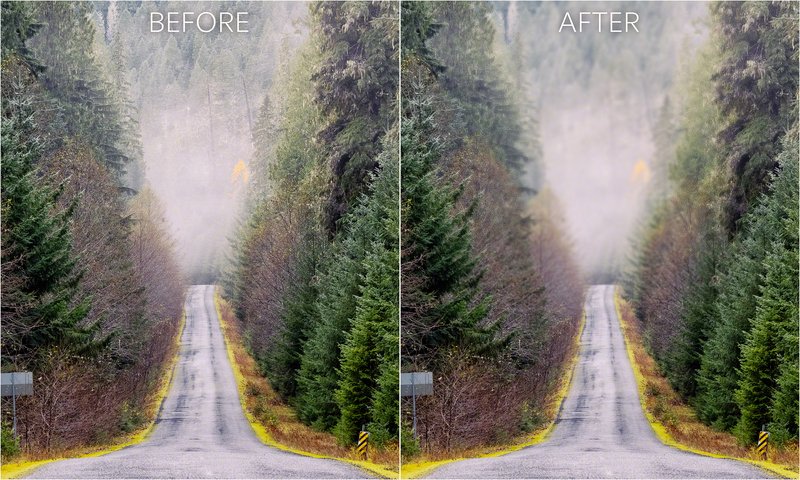 This effect works best on images that have leading lines, allowing the blur to easily fade into the distance. I will start with my photo opened up inside of Photoshop CC. When I add filters to images, such as the Blur Lab filter in Adobe Photoshop, I want to make sure that I am also working non-destructively. That is why I prefer to convert the layer to a Smart Object. To do this, I right-click over the layer I want to convert (in this case, the Background layer) in the Layers panel, and select Convert to Smart Object. Next, I add the blur. I go to Filter > Blur Gallery > Tilt Shift. The default blur “pin” is placed in the center of the image. I want to make the blur appear as if it starts from the front portion of the photo, so I relocate the pin so that it sits closer to the bottom. I also move the top solid line slightly upwards to extend the in-focus area, and also extend the dotted line upwards a bit to increase the feather. Then, I increase the Blur amount to +23. When I’m finished, I click OK at the top of the screen. In order to make this blur look more realistic, I need to mask out the blur from the trees on the right and left areas of the image. To do this, I first click on the Filter Mask so that a border appears around it. This shows me that the mask is active. Then, I select the Gradient tool from the toolbar, and make sure that my foreground color is set to black. At the top, in the tool options, I select Linear Gradient, and set the gradient to “Foreground to Transparent”. Then, I draw a straight, horizontal line on the right side of the image, starting at the edge and releasing at the middle of the image. This adds a gradient to the right side. I repeat this step on the left. The final mask in the Layers panel. My final image now has a soft blur that extends gradually into the distance. Thanks for the tip- I like Photoshop but it doesn’t like me. I started with PS Version 9 but for some reason my (PS Version 9 & Computer Configuration) configuration blew up, I now use Version 12. I guess if I were to ever go Pro I would switch to their cloud program. At any rate I appreciate your contribution toward helping the rest of us to better enjoy our situation. The Tilt-Shift Blur filter will not work on a Smart Object in PS CS6, but by first duplicating the background layer, adding the filter to the duplicate, then adding a mask to the duplicate, one can replicate the affect described in the article.